This one is a classic: the AP, probably the most important source of news media bias, packs multiple attacks on the GOP into a single headline. In the world of news media, only Republicans are ever “angry.” Democrats, no matter how numerous the death threats and wishes against, say, the NRA, are never angry. Likewise with “divided.” The Democrats have just come off an ideological battle that resulted in their raising taxes on all working Americans, via a 2% increase in the Social Security payroll tax. There is an interesting story there, but the news media kept it a secret because it did not reflect well on Democrats. 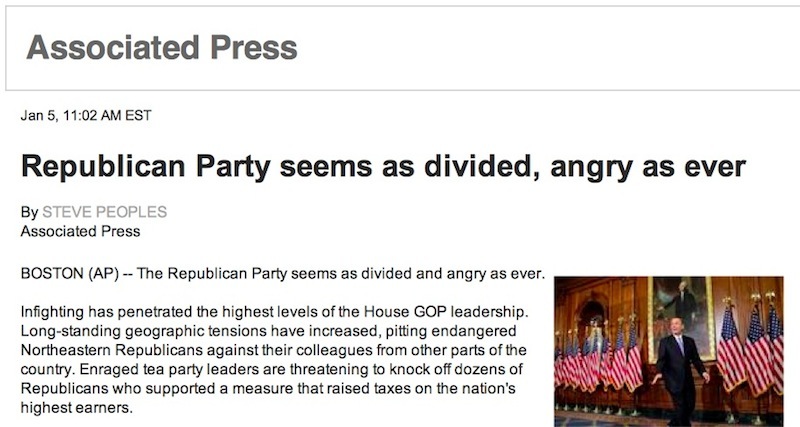 And note that Republicans being “angry” and “divided” is nothing new: they are as divided and angry as ever! Which is news, I guess. This one made me laugh out loud, but really, it isn’t funny. Yahoo News headlines are seen by more people, I would guess, than those in any newspaper. This one, too, kills several GOP birds with one stone. Why can’t those grumpy Republicans ever be happy? That’s one theme–even though sociological research has shown over and over that Republicans are happier people than Democrats. Then we have the implication that in the current series of battles over the budget, the Republicans can never be satisfied. They got everything they could possibly want in the fiscal cliff negotiations, right? So why can’t they be satisfied and cave in to the Democrats in the debt limit negotiations? And yet it is the Democrats who, last week, got all the tax increases they have always said they wanted, and now tell us they want more. Never will you see a headline suggesting that the Democrats should be satisfied and stop trying to tax and spend more. As I have said before, I do not think we can even imagine what it would be like to live in a country without a left-wing news media.